Every good knitter has a stash of unfinished projects! 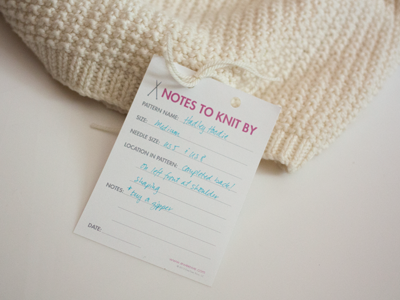 Notes to Knit By is a 25-sheet notepad specifically designed for your "works in progress." Remember important details like the size you're making and your spot in the pattern with these handy notes. Notes are 3.5 x 5" and can be tied right to your knitted garment! Notes to Knit By are only available by wholesale.